Industrial engineers and designers as well as managers working on new product development (NPD) typically do not have the time or the expertise to get involved in functions outside their immediate area. Yet the very nature of NPD requires a number of functions and processes to be performed concurrently. This is where simultaneous engineering comes in. Simultaneous Engineering for New Product Development offers state-of-the-art, integrated coverage of these two hot topics in manufacturing. Industry expert Jack Ribbens draws on firsthand experience with the successful application of simultaneous engineering in the automotive industry, discussing how this approach can help streamline the entire development and production process, resulting in high-quality, competitive goods. He examines all phases of the process, devoting a chapter to each key element-from market research to design and engineering to manufacturing, selling, and customer service and support. And while most books on concurrent engineering stress the theoretical aspects of the field, Ribbens's book is decidedly practical, complete with case studies from the automotive, aerospace, heavy vehicle, and electronic industries that can be applied to any manufactured product. 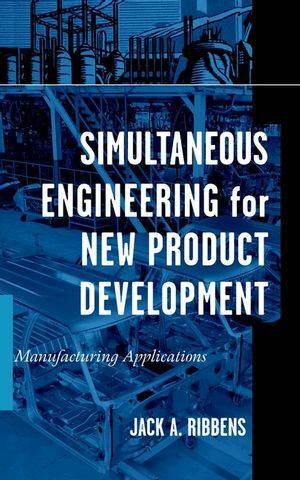 With mathematical model development as well as useful graphs, checklists, and references, Simultaneous Engineering for New Product Development will help manufacturing professionals take advantage of new trends and technologies in manufacturing well into the twenty-first century. JACK A. RIBBENS is Principal of the New Product Development Company and past staff engineer with McDonnell Douglas and Daimler Chrysler. He has spent a large portion of his career developing methods to assess the insurability risks of new automotive manufacturing technologies. He acts as a consultant to the three big automotive companies and their suppliers. NEW PRODUCT DEVELOPMENT PROCESS PHASE ELEMENTS. After-Sales Support, Maintenance, Service, and Repair. ADVANCED PRODUCT DESIGN AND DEVELOPMENT TECHNOLOGIES. Heavy-Duty/Off-Road/Military Vehicle Mathematical Model Development.